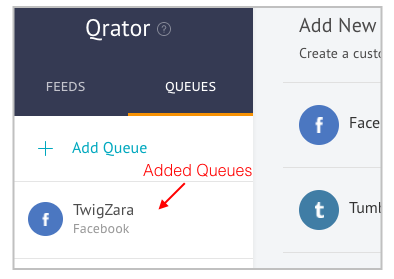 A Queue is a post scheduler for a specific Facebook page, Pinterest board or social media account. 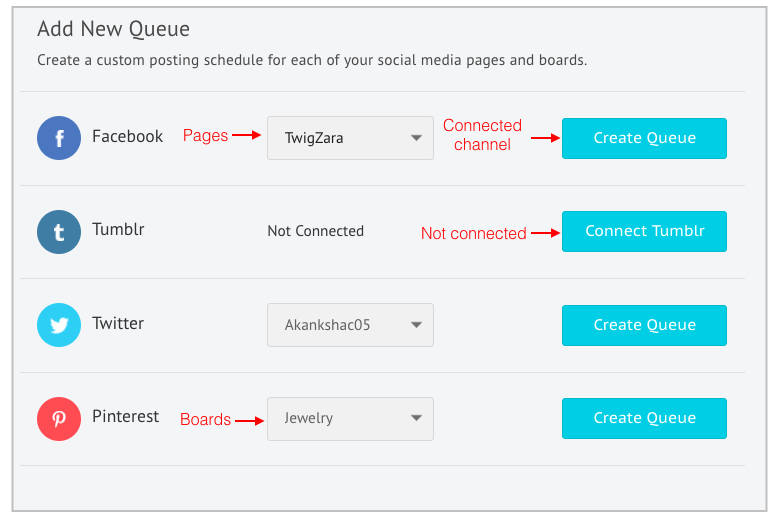 You can create Queues for Facebook pages, Twitter account, Tumblr blogs and Pinterest boards. Note: you'll be able to create Queues for pages, blogs and boards of the social channels that you've connected with Socioh for your other campaigns (Product Sale / Daily Deal / Coupons / Auto-Pilot). Learn more about how you can change accounts. In Q-rator, go to Queues. If you haven't added any Queues yet, you'll see the message - No Queues No Posts in the left panel. In the right column, you'll see all the social channels. The status of the posts will be mentioned next to them. Create Queue will be displayed for the channels that are connected and Connect for the channels that are not connected. Select the page / board / blog and click on Create Queue. You'll see your Queues in the left panel. How can I delete a Queue? How can I add post to a Queue?